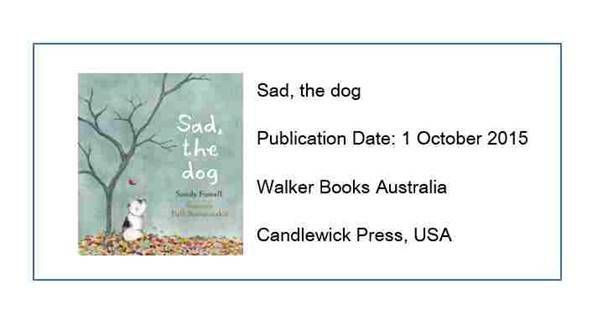 Sandy Fussell’s gorgeously poignant picture book, Sad, the dog, has just been released (Walker Books, Australia, and Candlewick Press, United States – more details at the end of this post), but you may also know her from her popular Samurai Kids series, along with many other books. What you mightn’t know is that she has written those books through the best of times and the worst of times. You’ll notice she mentions a Camp Quality bookmark that speaks of resilience, and Sandy is obviously a person who has resilience in spades. She also has a tremendous sense of generosity, and has been wonderfully supportive of many authors and illustrators in the Australian Children’s and YA scene (me, included!). So in light of all that, I’m really happy that today it is HER being featured. Over to you, Sandy, where does the magic happen? I squeeze writing into all sorts of multi-tasking spaces. 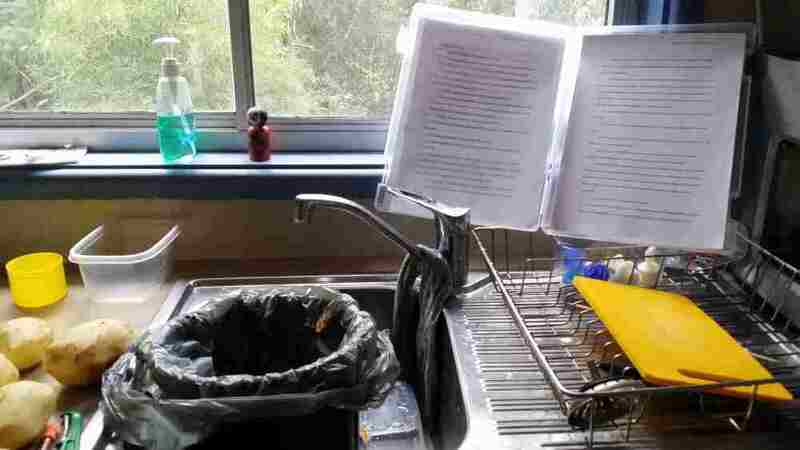 Here’s how I edit preparing dinner. 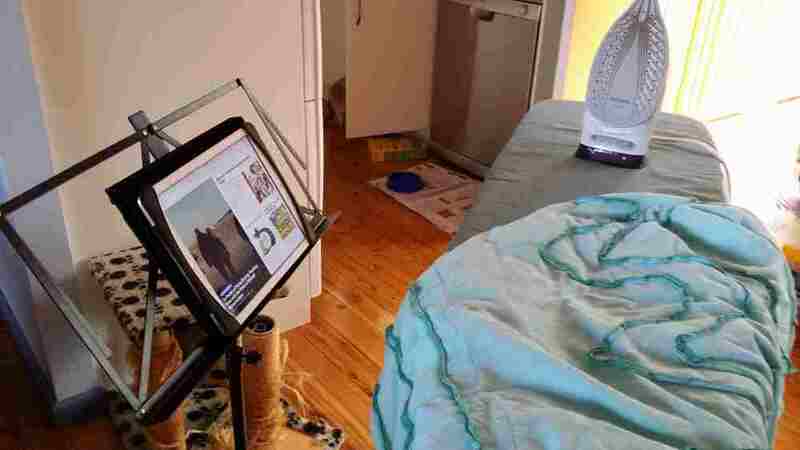 Here’s how I check Feedly and make research and story idea notes on my iPad while I’m ironing. 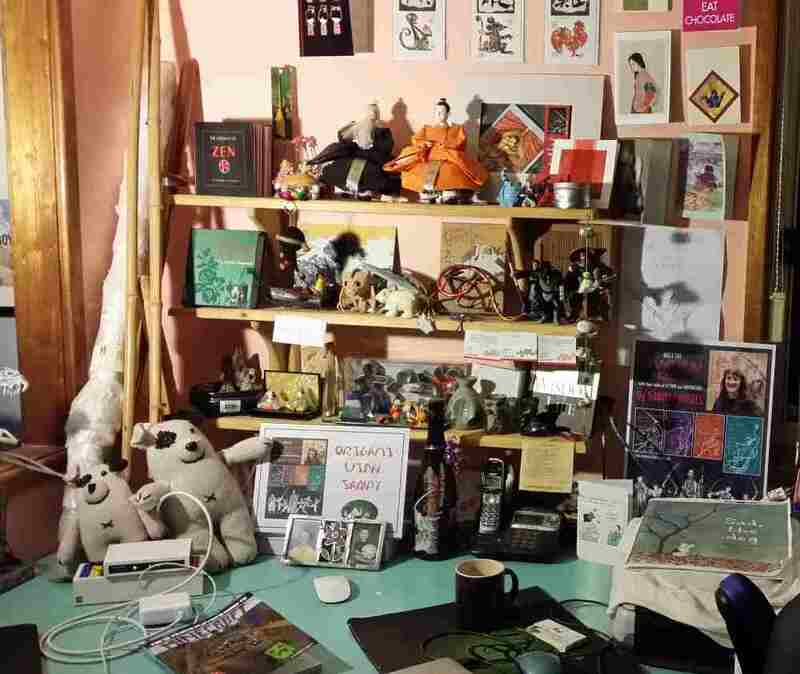 When I get a choice, I like to write at my desk, surrounded by literary clutter. Friends and family often tease that I’m too easy to please. It’s true, little things make me happy. When I look around my desk, I see it’s chock-a-block with small writing related treasures. This is what I see when I look right. Pride of place is the “Best Samurai Mum in the World” picture my youngest son drew for me. When my first book White Crane was published, a friend made me a Samurai Kids bottle of wine to celebrate. Another friend brought me the Fire Lizard (SK 5) home from a holiday to central Australia. My sister gave me the polar bear when Polar Boy was shortlisted. One of my son’s teachers (now a good friend) sent her husband on a mission to find “Yoshi” and “Sensei” during a business trip to Japan. That’s them on the top shelf. Walker Books friends bought me ninja cookie cutters and a book of Zen wisdoms. A writer friend, after I received a truly awful review, bought me an oriental pin cushion so I could vent in a politically correct manner. And there are dragons. Always dragons. And Zen sayings. And a Camp Quality bookmark about resilience that speaks to me every day. And a little bucket of spilt milk reminding me few things are worth crying or stressing over. On a Japanese enamel tray (another gift) on the bottom shelf is my “philosopher’s zone” where three frogs, two Ninjago lego, Snoopy, Woodstock, Tigger and Pooh contemplate the words of Buddha and Lao-Tzu in the glow of a blue crystal pyramid. 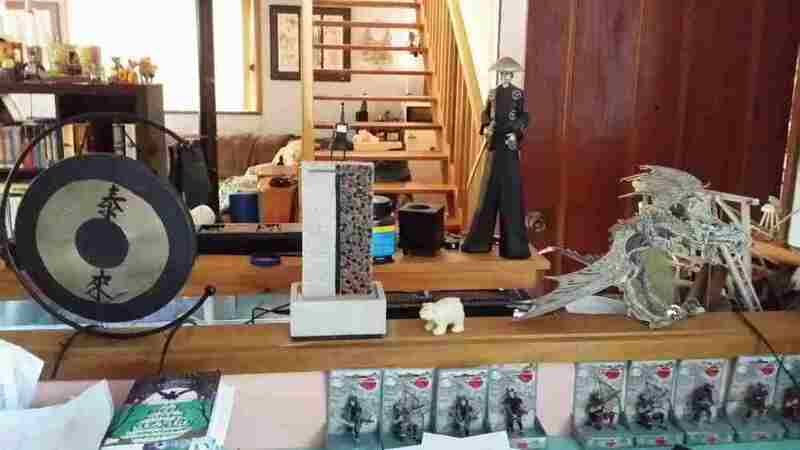 My shakuhachi flute, bokken and bo are off to the right. The knitted dog is Sad, the hero of my first picture book Sad, the Dog due out in Australia and the US in October. A friend knitted me two Sads– one to use to tell the story and one to offer as a launch prize with the book. I am spoilt by supportive friends. This is what I see when I look left. More books and samurai warrior figures. The Love of My Life bought me the water fountain so I could write to the zen sound of falling water. I don’t have any childhood trophies, due to my inability to catch or hit anything, but when I finish a book I buy myself a ‘writing trophy’. The Samurai statue was for White Crane, the gong for Owl Ninja, off to the side where the camera missed it is an Inuit patterned blanket for Polar Boy. Handy for writing in cold weather because that’s a Frost dragon on the right. Finally on the far back wall is a framed set of posters for the Samurai Kids series featuring the brilliant art work of Rhian Nest-James – another gift. 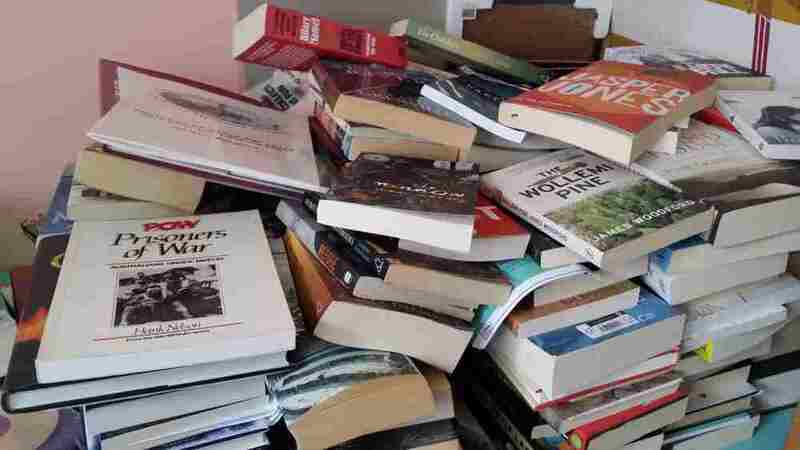 Some books are research, some are for review, some will teach me to be a better writer and all are to entertain me. There are 223 books in the pile although it’s not as overwhelming as it sounds as many are middle grade and I can read them in an hour. It’s particularly high because I went to the Lifeline Book fair recently and bought 40 books! How could magic not happen surrounded by all these books and wonderful writerly reminders from friends and family?